As expected after seeing the phone in a teaser yesterday, AT&T will “exclusively” add the Samsung Galaxy S4 Active to its growing line of smartphones. The phone will arrive on June 21 for $199 with new 2-year contract and in two colors, Urban Gray and Dive Blue (no orange!). The Galaxy S4 Active brings together high-performance and “real-life,” according to Samsung and AT&T. What they mean is that the phone can withstand the elements, yet is just as powerful as the regular Galaxy S4. But you already know that, since we’ve written about this phone a dozen times now without having ever touched it. The Galaxy S4 Active will be on display at Samsung’s June 20 Premiere event in London. We’ll have coverage of the device for you around that time. Interested? Frustrated at the “exclusive” AT&T grab? With summer in full swing, you need a phone that can go just about anywhere and endure the demands of an active lifestyle. To help you keep up with whatever comes your way, AT&T* and Samsung Telecommunications America (Samsung Mobile) announce the Samsung Galaxy S® 4 Active™, an evolution of the popular Galaxy S® 4 designed to withstand the hazards of everyday life. Beginning June 21, you can pick up the Galaxy S 4 Active from any AT&T store or online for $199.99 with a two-year agreement. For consumers who prefer to place their orders now, AT&T will begin taking pre-orders on June 14 at www.att.com/galaxys4active. The Galaxy S 4 Active will be available in two colors: Urban Gray and Dive Blue. 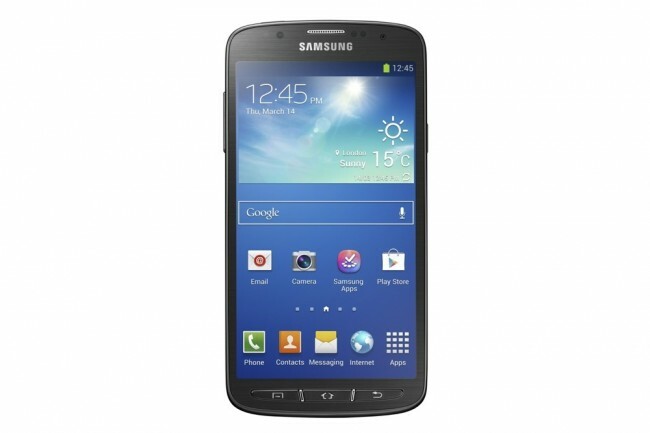 The Galaxy S 4 Active runs on AT&T 4G LTE, which currently covers more than 200 million people; with plans to expand to cover 300 million people by the end of 2014. AT&T’s 4G LTE network was called “blazing fast” in a report** by independent testing organization RootMetrics. The report found AT&T’s 4G LTE network delivered the fastest pure LTE speeds in markets where AT&T provided 4G LTE. The Galaxy S 4 Active was designed around life. It is IP67 certified to be water-resistant and dust-resistant, making it perfect to take on any summer vacation whether it’s camping or the beach. It also has an Aqua Mode feature that lets you capture photos and videos underwater. Its 5-inch FHD TFT display is made from Gorilla® Glass, which is specially built to be tougher and more scratch-resistant. It runs Android 4.2 (Jelly Bean) and comes packed with a quad-core processor for faster, smoother gaming and apps. But there’s more to the Galaxy S 4 Active than its sturdy, more resilient exterior. It also includes high-performance features that let you get more done on-the-go. The 8-megapixel camera includes multiple custom shooting modes, including Aqua Mode and Eraser Shot. It also features enhanced low light performance to help you get the shot you want even when lighting isn’t ideal. The Galaxy S 4 Active has an Integrated Infrared (IR) controller which acts as a TV remote control, so you can use your smartphone to control your home theater system. When you’re on-the-go, Samsung Hub gives you access to more music, movies, books and games from multiple content sources all in one place– perfect for passing the time on summer road trips, or even while waiting in line while running errands. Air View™: Hover your finger over photos, files, links and text for an instant preview. Air Gesture™: Skip to the next song or photo, check your notifications or, if you’re driving, automatically answer a call on speakerphone just by waving your hand over your phone. Eraser Shot: Remove unwanted background distractions in your photos and videos with just one touch. Drama Shot: Capture a time-lapse event all in one frame. Samsung Smart Pause: While watching a video, if you look away from the screen, the video will automatically pause and wait for you to return. Story Album™: Create a printed book of your photos and have it delivered right to your door. The Galaxy S 4 Active is a master multi-tasker. Features like Multi Window let you use two apps side-by-side like a PC so you can reference your notes while writing an email or follow the game live while checking out your friends’ reactions on social media simultaneously. This smartphone is SAFE™ (Samsung For Enterprise) to help keep your work data secure and separate from your personal content. Whether you are in the office or on vacation, the Galaxy S 4 Active balances stylish, professional design with enhanced durability. Additionally, the Galaxy S 4 Active features an optional Easy Mode that simplifies the home screen with larger icons and your favorite apps. AT&T Inc. (NYSE:T) is a premier communications holding company and one of the most honored companies in the world. Its subsidiaries and affiliates – AT&T operating companies – are the providers of AT&T services in the United States and internationally. With a powerful array of network resources that includes the nation’s largest 4G network, AT&T is a leading provider of wireless, Wi-Fi, high speed Internet, voice and cloud-based services. A leader in mobile Internet, AT&T also offers the best wireless coverage worldwide of any U.S. carrier, offering the most wireless phones that work in the most countries. It also offers advanced TV services under the AT&T U-verse® and AT&T |DIRECTV brands. The company’s suite of IP-based business communications services is one of the most advanced in the world. Rovio Begins Teasing New Angry Birds Title, Could be an Avian Mario Kart of Sorts?